Unless you were hiding under your bed, and I won't judge you if you were, you probably knew about the full moon which was to happen over Christmas. If ever there was a photo opportunity, this was it. I could put the camera flush against the house or the window or a tree and get a decent enough photo. December 22nd was partly cloudy. 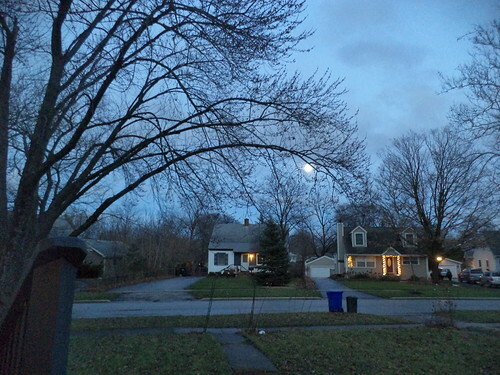 It had rained and drizzled all day, but it was still in the 40's when the moon rose over the houses across the street. It was a Wednesday night because I had taken the garbage and recycling to the curb when I came home from work. On December 23rd, more clouds were predicted. The temperatures had dropped during the day. A cold front was pushing through and with it came bands of clouds. 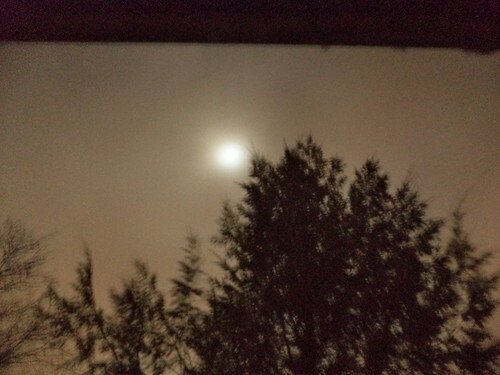 By the time I went to bed, the moon was obscured. I went out at 9:45 to get this shot. 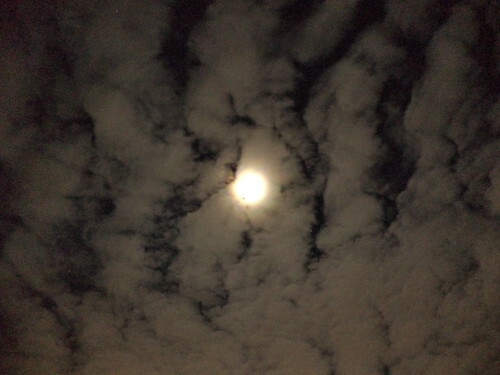 The bands of clouds give the sky an eerie quality. You could imagine this is the moon over Dracula's castle in a low-budget horror movie. A bat should fly past the moon to really raise the hairs on the back of your neck. Christmas eve was mostly cloudy. There was a snowstorm coming, although it didn't drop much snow on me. I went out shortly after moon rise and couldn't see the orb. Going out at 9 produced this photo. The clouds were thickening, almost like Mother Nature was adding flour to make white sauce. If I'd walked to be close to a street light, the rising moon would have looked very similar. In another 30 minutes, it would be completely hidden and the snow would start. It was kind of depressing to have a snowstorm come through and hide this celestial event. The moon's path across the sky was the longest it would be for the year. I like to sit on the floor in the moonlight and just watch. It's such a bright, clear light. In December of 2026, there will be another full moon around Christmas, although the fullness will be on December 23rd. Maybe the weather will cooperate for photography?